Hi mommies. Can you believe it? Your baby is already halfway through to her first year. At six months your bumblebee is cooing away to her heart’s delight filling you with awe and happiness. The little one has learned to identify and communicate with her most loved person – the mother! There are lots of developmental milestones that your baby will reach this month. To find out all the developmental aspects of your baby at 6 months, keep reading. At 6 months, the little ones are ever curious to explore the things around them. They still have very short attention span but they can stare at something for over 30 seconds if it catches their fancy. Your little one is trying to sit up on her own although their mother’s lap is their favorite place to hang out. Let us see the physical developments of your munchkin this month. Rollover: Most babies master the ability to roll over by this month. Keep them on their stomach and you will notice your bundle rolling over to face you. The back muscles are growing stronger enabling the baby to perfect this skill. Some little ones may take a month more to get rolling, but that is perfectly normal. Sitting up: Prop a cushion behind your munchkin and watch her trying to sit up with the support. Babies at this month are learning to sit on their own with the support of their backs. They may not be able to hold up in the sitting position for long, but once they are able to sit up for just a few seconds without support is a great achievement in their developmental milestone. Within a couple of months, most babies would be able to sit up independently. The desire to crawl: Your baby may not be able to move from point A to point B at six months, but you will be thrilled to notice that they make the effort to do so. How? By trying to crawl! At 6 months, most babies do not crawl on all fours. 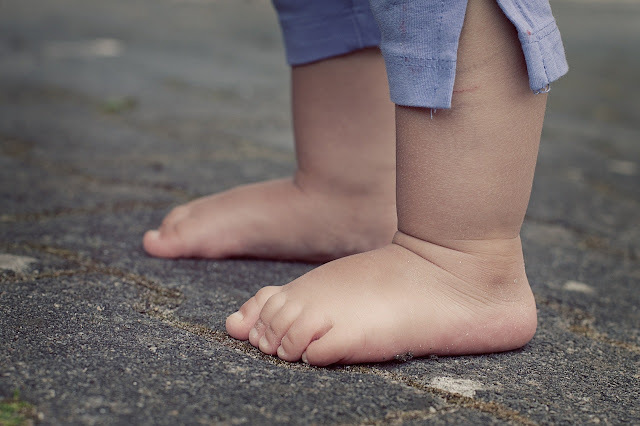 Crawling covers a wide range of movements at this phase of life: moving on the tummy, bottom shuffling, kicking the legs to get ahead, or moving backward while trying to crawl. As the motor skills continue to improve and there is better muscle coordination, your baby will begin to move around your home keeping you busy in just about two months. Teething: You may not still see a tiny bud of white sprouting from your baby’s gums, but the teething process generally begins by this time. There are sensations that babies experience that make them chew on things that are absolutely not edible such as rubber soles, clothes, leather bands, metal rods and so on. Instead of snatching away these things as babies try to get them, give the little one cold veggie sticks such as carrots and cucumber. These will soothe the gums and not pose any choking hazards. Water filled teethers are also helpful but then they need to be cleaned every time after use. Better sleep cycles: By now your baby understands the difference between day and night. They tend to sleep for longer hours at night and may not wake you up for a good 5 to 6 hours. The raking grasp: As your little one’s hand and eye coordination are getting better, they can now hold tiny objects with their fingers. This is known as the raking grasp and allows babies to pick up tiny objects from the ground, something that you have to be extra careful about. Understands cause and effect: You little one is becoming intelligent by the day. At around 6 months the tot figures out the concept of cause and effect. They begin to understand that when they do something, a certain reaction is expected. You will find babies trying to test the reaction of the mother when they perform a certain action such as making a certain sound or waving their hands. Response to known sounds: Have you noticed that as your baby is progressing through its 6th month, the little one responds when you call your munchkin with a special name. Babies begin to understand that they have a name with which others communicate with them. As this understanding becomes more intense, they respond quickly to their name and can also identify people as ma, pa, and other specific names. Some babies may not respond as well as the others. Give it another couple of months and almost all babies will begin to communicate once their names are called. Vocal variations: As the little ones begin to recognize faces and names, they try to mimic vocal expressions. For example, when you laugh out loud, your baby will try to laugh too with a gurgling sound. If you blow air while making the sound ‘boo’ babies will do the same, of course with a shower of spit! Feels safe with familiar faces: Babies can recognize the faces of people whom they see on a regular basis. The familiarity gives them a sense of safety, so if the closest caregiver gives the baby in the hands of such a person, the baby will not burst into a crying fit. But try the same thing with an unfamiliar face, and the stranger anxiety will lead them to wail and shout in panic. Mirror mirror: Babies by this age do not feel flustered looking in the mirror. They recognize their own faces and may often make funny expressions. Parents can make the baby look at their reflections in the mirror, talk and make facial expressions to make the little ones giggle with glee. Read to them: It is true that your baby will probably not understand a word of what you are reading, but opening a book with big bright pictures and reading with loud voice modulation will capture their ever-curious minds and help them relate words to objects gradually. Animal sounds: Show babies domestic animals such as cats and dogs and mimic their sounds. Babies love natural sounds and will have a lot of fun listening to the bow-bow and meow-meow.